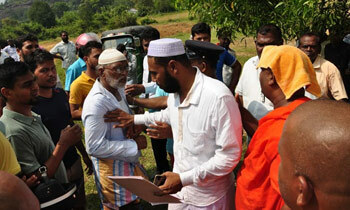 A tense atmosphere prevailed in Manikkamadu area, in Ampara yesterday when a group of Muslims protested against constructing a building for the historic Manikkamadu temple that has one of the Cheithiyas surrounding the Deegavapi Cheithiya. The protestors claimed that the land in question belonged to the Muslims in the area and not to the temple. However the Maha Sangha including Chief Incumbent of the Manikkamadu temple Ven. Ambagahapitiye Seelarathana and Director of Pirivena Education North and East and Chief Incumbent of the Pulukunawa Rajamaha Vihara and the Aranthalawa Buddhist Centre Ven Kirindiwela Somarathana Theras said the a temple had existed there before the military conflicts and that they obtained permission from President Maithripala Sirisena and the relevant authorities including the Department of Archaeology, the Land Commissioner and the Government Agent. 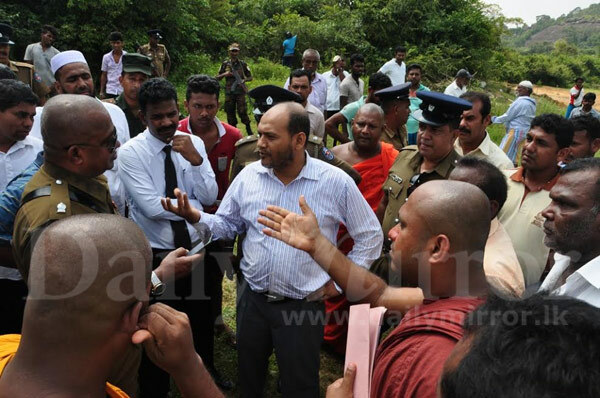 Member of the Eastern Provincial Council Harris Samsudeen who came with a lawyer told the Buddhist monks that the building should be constructed with permission from the relevant authorities and that he was not aware that such permission had already been obtained. 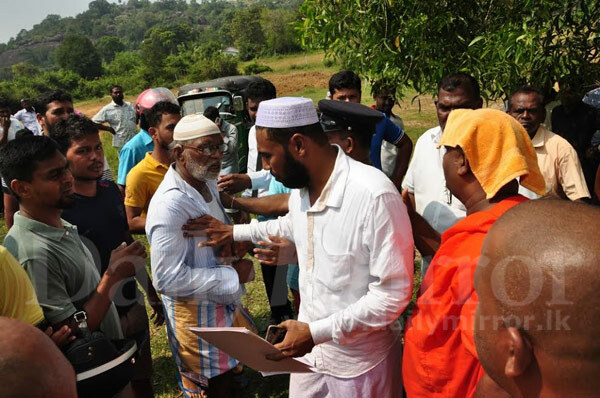 Muslims in Sri-Lanka, came during Pada Yarta and settled down in Eastern part of Sri-Lanka time to now they claim they own land in Sri-Lanka. They dont have any legal right to infer with Buddhist monks. These Islamists shall be thought the history of Deegawapi . They have invaded the land belongs to temple and now protesting when old temple is rebuilt. මෙතන අපේ රජමහා විහාරයක්‌ තියෙන්නේ. යුද්ධයට පෙර සිංහල පවුල් සීයයක්‌ විතර මෙතන පදිංචිවෙලා හිටියා. පස්‌සේ යුද්ධ සමයේ ඒ අය මෙතනින් ගියා. අපේ පන්සලක්‌ යුද්ධයට පෙරත් මෙතන තිබුණා. මේ වෙද්දී ඒ ඉඩම් හොරට බලපත්‍ර හදාගෙන අත්පත් කරගන්න හදනවා. මෙම ස්‌ථානයේ විහාරස්‌ථානය හදන්න අපි ජනාධිපතිවරයාගේ සහ පුරාවිද්‍යා දෙපාර්තමේන්තුවෙන්, දිසාපතිතුමාගෙන් සහ ඉඩම් කොමසාරිස්‌ ඇතුළු නිලධාරීන්ගෙන් අවසර අරන් තියෙන්නේ. මේවා දිඝවාපියේ පරිවාර දාගැබ්, මේවා වසර සිය දහස්‌ ගාණක්‌ පරණ අපේ උරුමය. මේවා කාටවත් විනාශ කරන්න දෙන්න බැහැ. මෙම පුරාවිද්‍යා ස්‌ථානයේ පුරාවස්‌තු තිබෙන පර්වතය පාමුල කොහොමද ඉඩම් වලට බලපත්‍ර ලබා දෙන්නේ. Since when this country has written land for the Muslim's ? Muslim encroachment in this area has reduced the heritage temple land from 12000 acres to 655 acres. I think Champika and the Buddhists should go to sleep until the extremists take over the whole country like they did with Malaysia, Indonesia, Afghanistan, Pakistan, Bangladesh and India which were erstwhile Buddhist countries. When will Sinhale have a Sinhala leader with a spine? This is just the starting near future they will tell Sri Mahabodia is in a land own to muslim, time has come to open our eyes now. You Sinhabahu.since you and your parents eating grass this country . It is not the history but your misleading imagination. Very soon Muslims will take over this country legally.